There is a reason why traffic lights are installed at intersections throughout Connecticut. They keep traffic flowing smoothly and allow road users to navigate through intersections safely. However, some drivers don't feel the need to uphold their duty of care at traffic lights. Some drivers may speed up to avoid stopping when the light turns yellow. Other drivers may run red lights altogether. In either scenario, responsible drivers, often those who have the right of way, are put at risk. According to The Drive, the upsurge of accidents caused by red-light runners has prompted the Insurance Institute for Highway Safety (IIHS) to investigate the prevalence of these accidents. Joining their efforts, the American Automobile Association (AAA), Advocates for Highway and Auto Safety, and National Safety Council (NSC) are urging municipalities to install more red light cameras. The IIHS reports that fatal accidents caused by red light runners have increased by 17 percent in the United States between 2012 and 2016. In 2012, approximately 696 traffic fatalities occurred. A total of 811 traffic fatalities occurred in 2016, which marked the highest number of deaths in nearly a decade. Efforts are currently being taken in Connecticut to increase the presence of red-light cameras. In New Haven, community alder Abby Roth is urging lawmakers to implement a red-light camera pilot program, according to the New Haven Register. In an effort to unveil the issue of red-light runners, Roth took to the corner of South Frontage Road and York Street to count how many cars ran red lights between 8 am and 9 am on three separate days. She found that a total of 156 drivers failed to stop when the light turned red. The issue has been followed by red light camera advocates for years, some pleading for change. But the movement to implement red light cameras hasn't picked up enough steam, even after the death of a Waterbury pedestrian who was struck when a car jumped the curb she was standing on. According to the Office of Legislative Research, there have been ten bills introduced between 2010 and 2017 intended to implement automated traffic enforcement. However, of the two that were deemed favorable, one died in Judiciary Committee and the other on the House floor. Red light cameras can be beneficial to crash victims. In many cases, proving fault in an intersection accident can be difficult. However, the video captured by a red light camera can provide clear-as-day evidence, which can be used to prove negligence. Additionally, if a negligent driver leaves the scene of a crash, and the crash victim is unable to write down their license plate, he or she can be identified through camera footage. 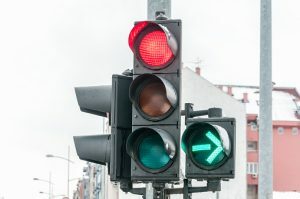 If you have been injured in an auto accident in Connecticut due to a red light runner, it's crucial that you speak to an experienced attorney at The Law Offices of Mark E. Salomone & Morelli.